Tonight’s special guest is Abhi Ghosh, a scholar of the Sutras. We will begin our discussion of the Sutras.A sutra (Sanskrit: सूत्र, Pāli: sutta, Ardhamagadhi: sūya) is an aphorism or a collection of aphorisms in the form of a manual or, more broadly, a text in Hinduism or Buddhism. Literally it means a thread or line that holds things together and is derived from the verbal root siv-, meaning to sew. 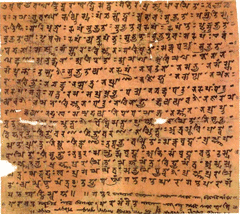 The word “sutra” was very likely meant to apply quite literally to these texts, as they were written down in books of palm leaves sewn together with thread. This distinguishes them from the older sacred Vedas, which until recently were only memorised, never committed to paper. Please listen, and feel free to send an email to dan@yogastudents.org if you have a question you would like to pose to Dr. Ghosh. Great show! I love listening to Dr. Ghosh.